I’m finally back in a good place. A place where I’m happy and excited about what’s to come. I’m excited to spend my nights entertaining family and friends and celebrating the little moments in life that don’t always feel like they add up to much, but really do mean everything when you look back on them. Thanks for sticking around to see if I was ever going to come back to my little corner of the internet. I really do appreciate your patience and understanding over the last little while. You guys rock! Real talk. I LOVE food. But, of course, I don’t love health food. I like sugar and sweets, and basically all of the snack foods that I probably shouldn’t indulge in as often as I do. (Oooops). 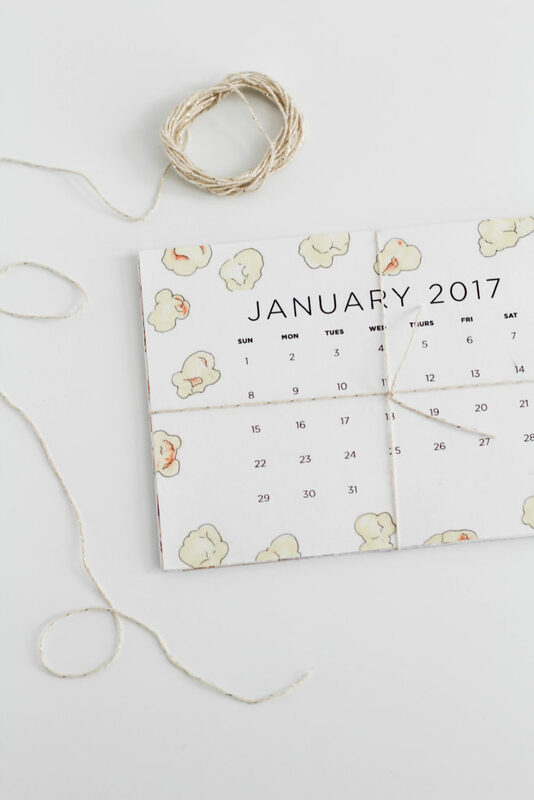 So when I was planning my ideas for the blog in 2017, I knew I wanted to create something revolving around my love of snacks. What better way to share my love of snack foods than in a calendar for the year? 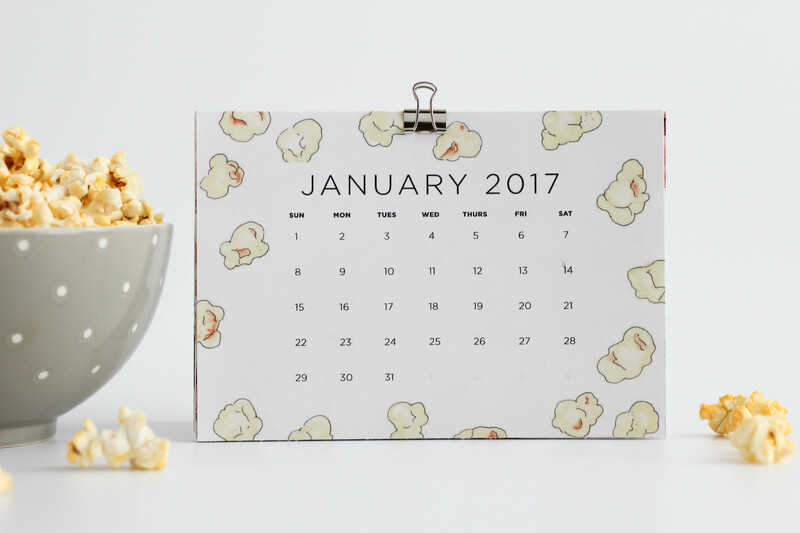 That’s not just one opportunity for me to spread the wealth, it’s 12 months of snack filled goodness! 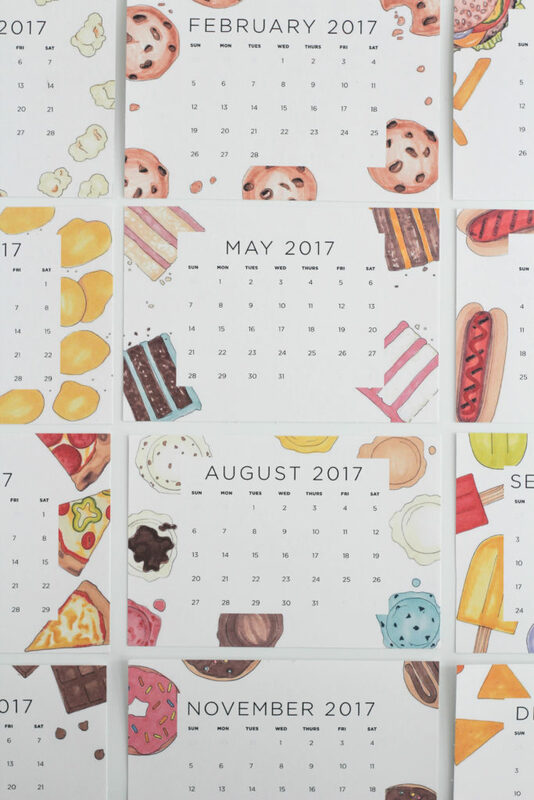 My awesome friend, partner in crime, and art/digital genius Katie HAND ILLUSTRATED each and every one of the snack filled months for you guys and she KILLED it. 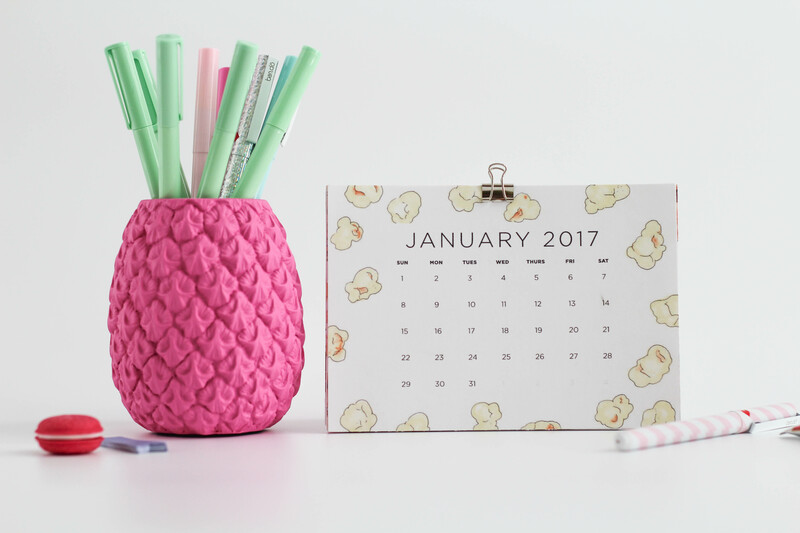 Each month is cuter than the next. Plus, it’s a FREE printable. Awesome, right? There isn’t much to explain for this project. 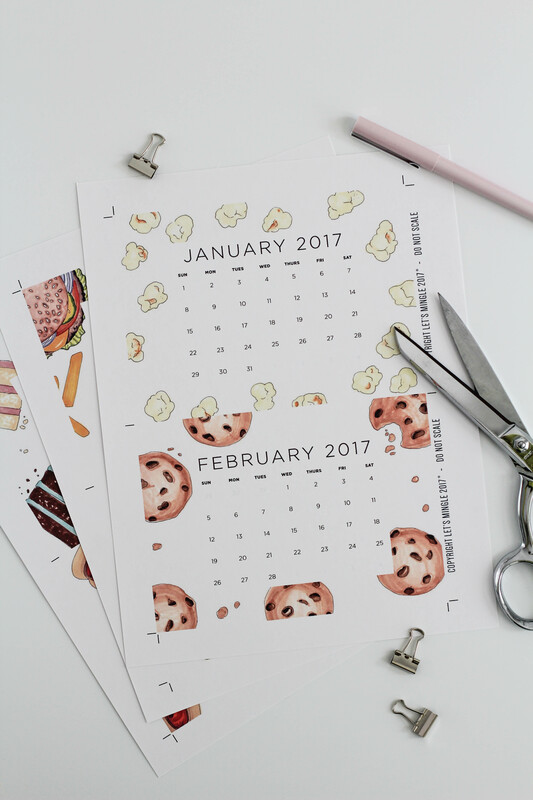 Download the 2017 free printable snack calendar file and print it on your home (or work) printer. I chose to print mine on card stock to make it more sturdy, but regular paper works too. 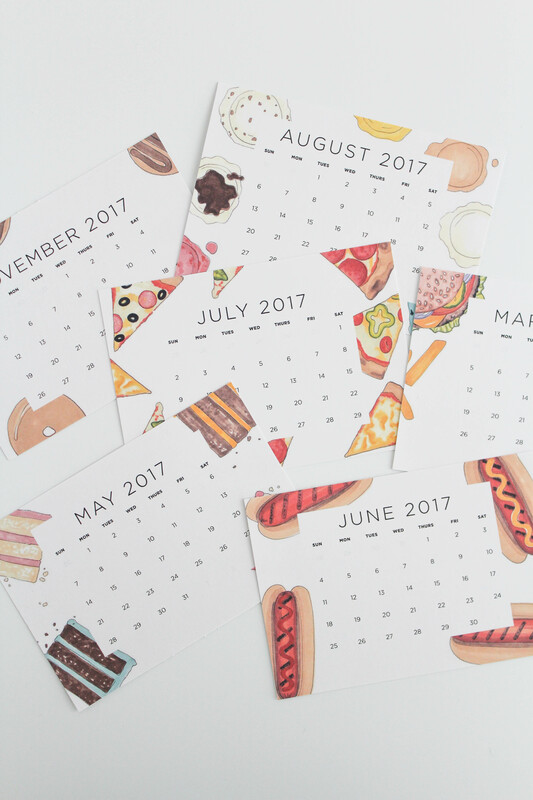 Also, the calendar file is sized and ready for printing. There is no need to scale the image up or down. The months fit two to a page and are about 5×7 in size when cut out. The only hard part is to figure out where to hang it! Paperclip them, post them on a mini clipboard or even print some out and give them to a friend who might enjoy snacks as much as I do! Can I have the FREE printable version of your calendar?